No-one can argue that the view from the main Grandstand at Cheltenham Racecourse at National Hunt’s greatest spectacle is stunning. 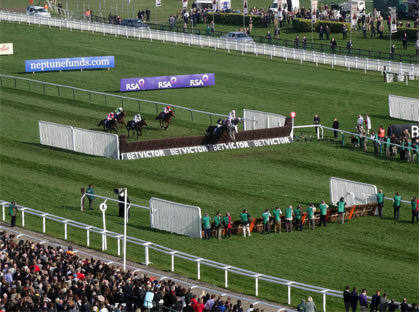 You can see the whole of the racecourse set against the backdrop of Cleeve Hill and you have the perfect view of the finish of each of these eagerly awaited races. We are offering a unique opportunity to enjoy racing from your own reserved seat located in the main Grandstand directly overlooking the finishing post. This elevated position provides the ultimate view of each race. Your hospitality is located within our luxurious shared restaurant which is situated just off the Hall of Fame. This package is very much for the racing enthusiasts as to access your reserved seats, you have a short walk through the Hall of Fame & Members bar to take up your perfect view of the racing. 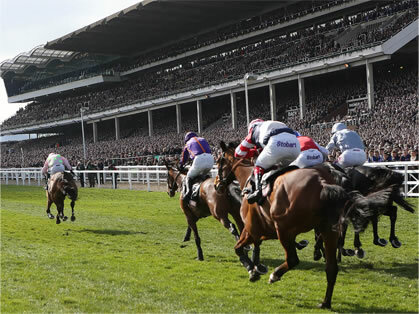 If you are entertaining clients this may not be ideal, however, if viewing the racing is the most important aspect of your day at Cheltenham then this package is ideal. For bookings of 2 upwards. Please note that due to a limited number of Grandstand seats we only have a small allocation of this package available per day of the Festival.